Mead believed, and I concur, that anthropology is about the variety of ‘life’ notabout a particular discipline, and the anthropologist, a skilled observer of multiple‘lives’, including the planet’s, and their interdependency. 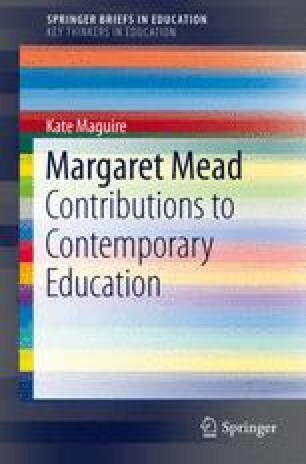 Her adherents over thedecades, including Bateson, have sought through a succession of publications anddiscourses to prevent her from being viewed ‘only’ as a ‘discipline’ anthropologistin the tolerated fringes of academia but rather seeing her, through her constantreflection and critique of both society and herself in her prodigious output, to havebeen one of the greatest influences on twentieth century feminism, emancipation,social and individual psychology and cultural studies. Her passion was educationfrom which such issues could not be separated. Marvin Harris (1968) the eminentAmerican cultural anthropologist referred to her work on cultural differences asbeing among the important events in the history of American intellectual thought.